Splendid post by James Clear on the so-called Seinfeld strategy of personal development. To be better comic, you have to write better jokes, and to write better jokes, you have to write every day. At Lean Pathways we call it the "drip, drip, drip" approach. At Toyota, we called it "every day, a little up". Malcolm Gladwell calls it the 10,000 hour road to mastery. But there's always some bozo trying to short circuit the process. Folks, there is very little new under the sun & moon. The fundamentals are eternal. And they include the Great Virtues. 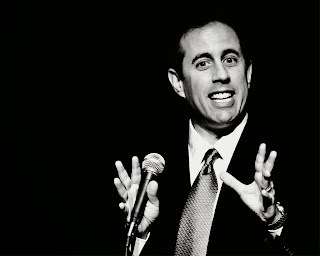 Jerry walked away from the Seinfeld Show, and an untold fortune, to marry and raise a family. He's said to be a genuinely decent guy, and a good father & husband.